Sometimes I leave work exhausted with no desire to cook anything for dinner. I just want to pick up something on my way home. 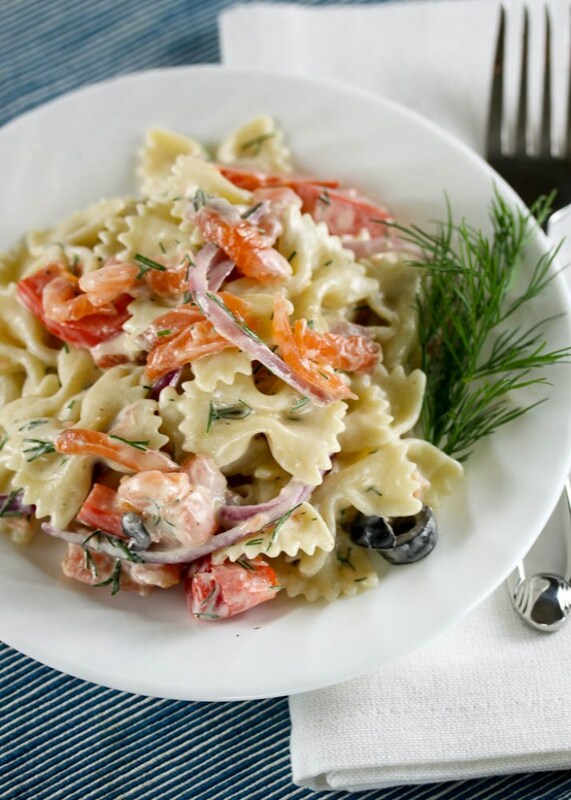 And there is one thing that I love, something that never disappoints me and always leaves me satisfied: the smoked salmon pasta salad from Whole Paycheck. I know it is ridiculous, but I just love it. Different Whole Foods locations make this differently. Fine, I confess I’ve probably had this at every single Whole Foods store in DC. Some locations make it with mayo, some make it with olive oil, some cook the veggies, and some don’t. This is my version, and yes, it is way cheaper to make it at home than to buy it pre-made. I made some smoked salmon for April’s charcutepalooza challenge (more on that on my charcutepalooza post on Friday), it came out buttery, perfectly smoked, and it just melts in your mouth. I hesitated to make smoked salmon at home in a stove top smoker because I was afraid it would overcook and turn into fully cooked, hot smoked salmon. I really wanted the texture of cold smoked salmon. So with a little tlc and a very low flame I was able to get the texture of store-bought cold smoked salmon. I don’t think I’ll be getting pasta salad from the store for a very long time. 1. Cook pasta according to package directors to al dente. Rinse with cold water. 2. Meanwhile, in a small skillet heat olive oil and sauté red onion and red bell pepper until it softens slightly, about 3 minutes. Season with salt and pepper. 3. In a medium bowl, combine mayonnaise, lemon juice, dill, and smoked salmon. Add pasta, veggies, and black olives. Taste and add salt and freshly ground pepper as needed. *If you don’t want to use mayonnaise, you can make this with 1-2 tablespoons olive oil instead of the mayonnaise and maybe a bit more lemon juice. buttery. that’s exactly how I described your salmon too. and melts in your mouth. what a perfect salad! I think it’d be also good if you used potatoes instead of pasta as an alternative. Yes, what a great idea! I also make a version of this with rice. Beautiful salad. Hoping to get some more hot smoking done on the weekend if NZ weather is up for letting me BBQ. Look forward to hearing how the challenge went for you. Mairi–Can’t wait to see what you make! Celia–I think it would be delicious with smoked mackerel. Paul–Thank you for stopping by! I used a stove top smoker, you can get it on amazon. It was so easy to use! that looks really good. i would probably eat it. 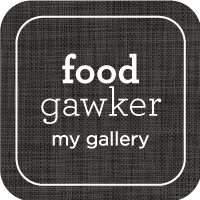 We’ve selected you as our Foodista Food Blog of the Day for this April 18, 2011! 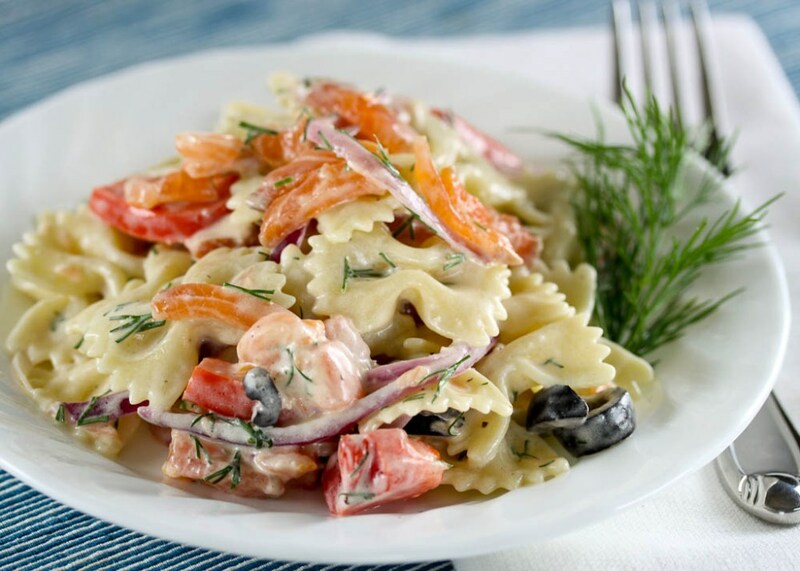 Your blog for Smoked Salmon Pasta Salad will be featured on the Foodista homepage for 24 hours. how long does this take to make….prep time? cooking time? It will take as long as it takes to cook the pasta, about 8-10 minutes. Then you just toss all the ingredients together. I’ve updated the recipe to reflect the amount of dry pasta needed and the serving size. Happy cooking! Love this recipe. I’d like to link to it on my blog but I can’t find an e-mail address to contact you directly. Can you please e-mail me back so I can send you proposal for permission to use photo and link to heidi at foodiecrush dot com ? Thanks! I’m eating this right now! Delicious! Took less than 30 minutes from start to finish. I’ve never done anything with smoked salmon before so I was a little skeptical but I had nothing to fear. I love it. This recipe will definitely go into my rotation. Loved this recipe so much I ate it for dinner two days in a row. Most pleasant!